Glue two clothespins together for the legs, with the third clothespin upside down for the head and antlers. Glue on the holly applique on his forehead, two googly eyes in the middle of clothespin, with the small pompom at the bottom for the nose. 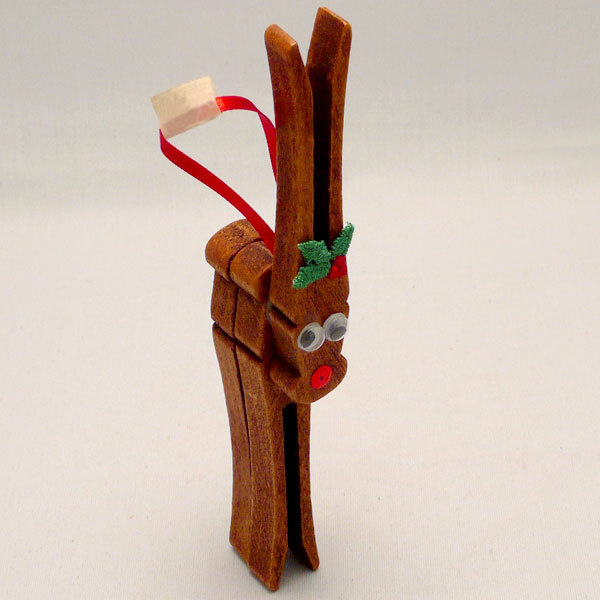 Glue ribbon behind head and antler clothespin, balancing the ornament for hanging. Glue popsicle sticks into a triangle shape. You may have to break a popsicle stick into a length long enough to balance the triangle shape. Paint the tree green and let it dry. 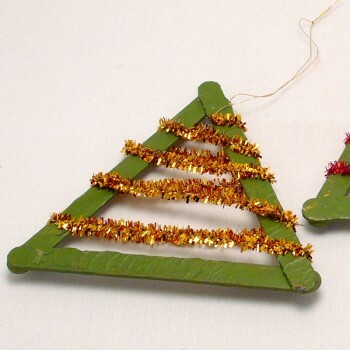 ‘Decorate’ the tree by bending the beginning of the pipe cleaner at the top, and zigzagging it down the tree, back and forth, hooking the end around the wooden tree. Cross skiis and glue together. 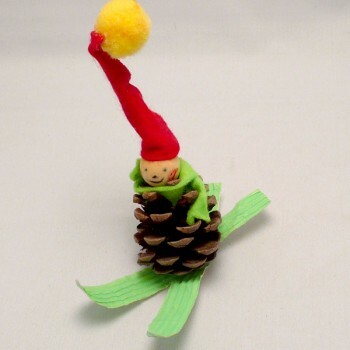 Glue pine cone onto skiis. Glue head on top of pine cone. Glue red triangle into long hat shape and glue on top of the ball head. Attach big yellow pompom by gluing on top of hat. Glue 2 stars together with glue gun (teacher can do this ahead of time if desired) attaching the hanger in between them. 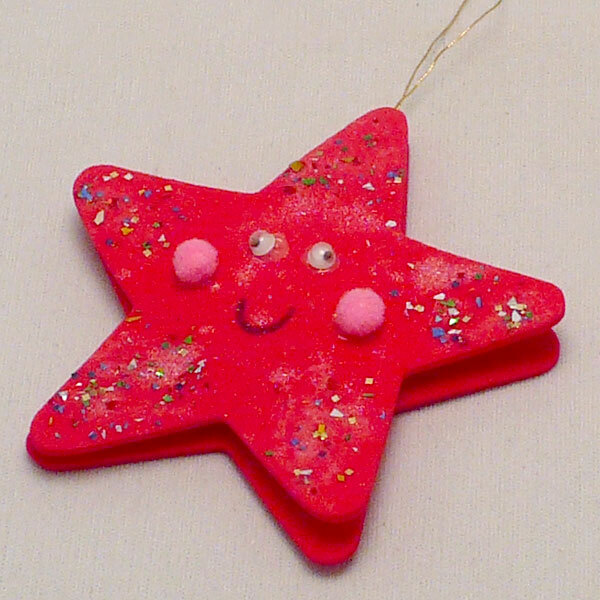 Students use white glue to add the eyes, cheek pompoms and glitter at the corners of the star. Use the red marker to add a cute little smile. Teacher piles felt scraps in centre of one circle, puts ring of glue around outside edge of that circle, places a tree ornament hook at the top, then presses the second felt circle to that first circle (this makes the basic ornament). 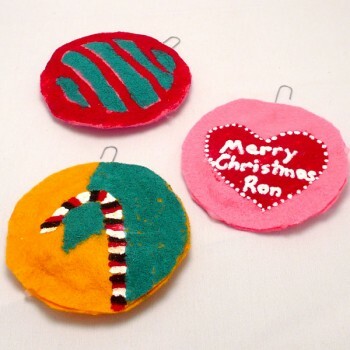 Student decorates with a Christmas greeting (Merry Christmas, or I Love You), or a candy cane hanging on a tree branch, or any design. Students decorate plastic drinking cups with permanent markers. Any design will do. 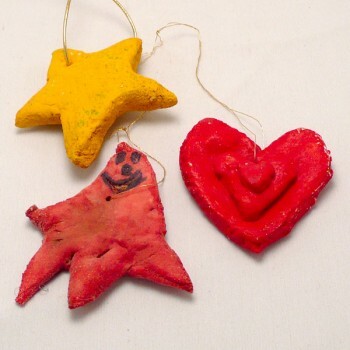 Try writing messages if you like, or drawing Christmas trees or wreaths and stars. Teacher places ornaments on tray at low temperature, watching until they shrivel down. This doesn’t take long. Let them cool. 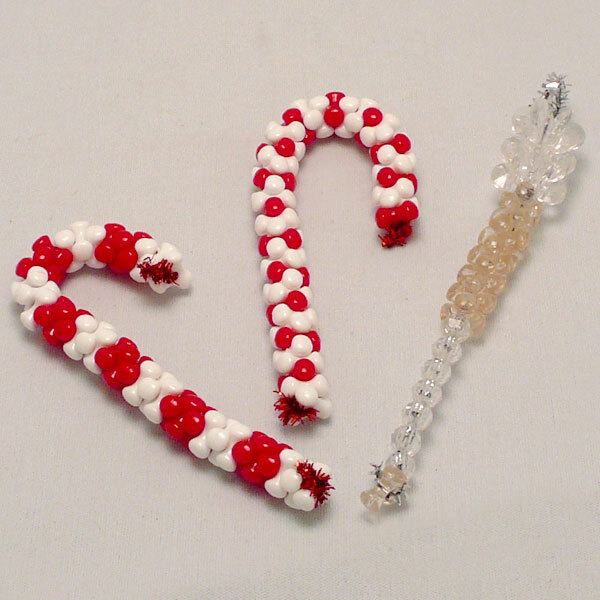 Y-shaped beads that interlock (white and red ones) for candy canes and for the icicle: flower-shaped thin-finned beads 3-5 for the top and about 8 Y-shaped beads that interlock, then 7 faceted round beads for the bottom of the icicle. 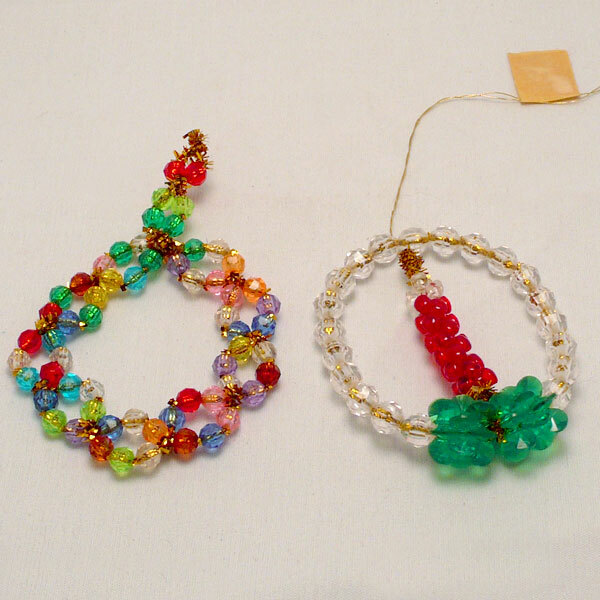 For the candy canes, thread on the Y-shaped beads, 1 or 2 red, then white beads, alternating, bending down the pipe cleaner at the beginning and end of the threading. 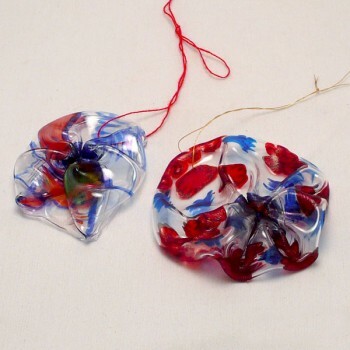 For the icicle, thread on the flower-shaped, 3-5 thin-finned beads, then the 8 Y-shaped beads, finishing with the 7 round faceted beads, remembering to bend the pipe cleaner at the beginning and at the end. Pipe cleaners will need to be cut to size. Using 2 pipe cleaners, thread 3 beads on each pipe cleaner, then twist together making a small circle*, then thread on 3 more beads on each pipe cleaner, twisting again. Continue until you have made a small wreath. Twist the end of the pipe cleaners to the space between the 2nd and 3rd small circle (noted by a * above in #1.) This is the hanger at the top of the wreath. Thread the clear round beads on a pipe cleaner. Don’t bend the ends yet. Add 3 of the green finned beads on each end, moving all the beads near one end, then twist the pipe cleaner together, making a circle at the end of one side of the pipe cleaner. Bend the remaining end of the pipe cleaner up into the center of the circle, then thread on the 10 red and 2 clear interlocking Y-beads making the candle. Twist the end of the pipe cleaner to make a flame. You can cut the pipe cleaner now or attach it to the top of the circle to keep the candle centered. 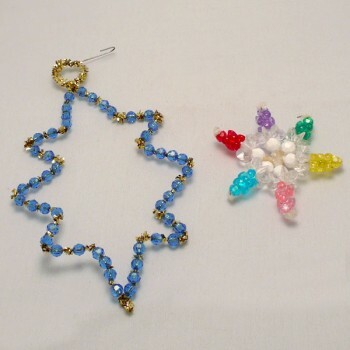 Blue Star shape: Twist pipe cleaner ends together at the top. Thread faceted round beads on each side, leaving some spaces between beads, bending pipe cleaner into star-shape, then twisting the 2 pipe cleaner sides together at the bottom. Star Spoke shape: Thread beads on spokes, starting with faceted white round beads, then thin-finned beads, followed by Y-shaped interlocking beads. Bend pipe cleaner over at the end of each spoke. 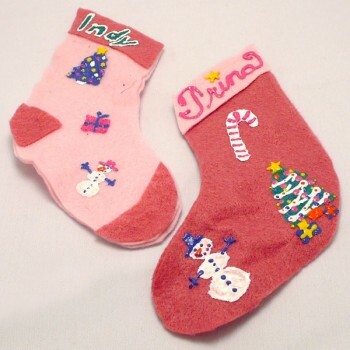 Cut out small stocking shape. Glue cuff and heel and toe patches. Recipe: 1 cup flour, 1 cup salt, 1 rounded teaspoon of powdered alum, water, bowl, paint. Add water slowly. Knead till clay-like, model. Dry. Paint. Teacher makes dough with children. Students get a piece of dough and presses into original shape or uses cookie cutters or tools to imprint designs. Fold red paper in half. Place a green piece of paper underneath. Cut out heart, leaving fold on left side. Put green heart aside. On red heart, on the top side, cut 3 strips diagonally from right side to left, cutting off the right part of the heart, but leaving a 1/4 percent uncut red at left side. 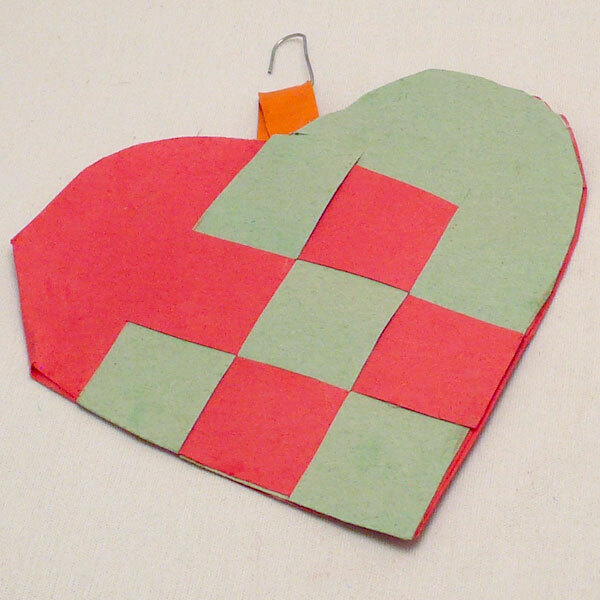 Cut 3 diagonal strips in the green heart, cutting off the left side. Have students weave the green and red strips together. Attach a ribbon or paper hanger between the 2 sides then glue it in and also glue down the woven strips unto the solid red back of the heart.